One of the more accessible outings from off-putting iconoclastic writer-director Todd Solondz (Storytelling, Happiness, Life During Wartime), the independent comedy-drama Dark Horse will irritate those not familiar with the filmmaker’s work and simply annoy others. But that would make it a success for Solondz, a master of cinematic discomfort who is in top form with Dark Horse, one of his best and most off-handedly funny efforts to date. Selma Blair and Jordan Gelber embark on a troubled romance in Dark Horse. The film focuses on Abe (Jordan Gelber, TV’s Boardwalk Empire), a thirty-something, narcissistic, toy-collecting schlemiel who lives in the Jersey suburbs (similar to those seen in his Solondz’s 1995 breakout feature, Welcome to the Dollhouse) with his real estate dealer father (Christopher Walken, Catch Me if You Can) and comforting, clueless mother (Mia Farrow, Rosemary’s Baby). Abe, who also manages to do as little work as possible for Dad, gets a chance to change his life when he meets sickly slacker Miranda (Selma Blair, Columbus Circle) at a wedding. A whirlwind romance of a most uncomfortable nature ensues, with Abe’s naïveté and Miranda’s ex-boyfriend (Aasif Mandvi, Today’s Special) adding to the couple’s ongoing problems. A terrific ensemble and Solondz’s eye for the absurd help make the proceedings oddly endearing despite a parade of rather unlikable characters. This time around, Solondz plays down the explicit perversities that featured strongly in his previous films, choosing instead to go into fantasy sequences that will likely leave some perplexed. 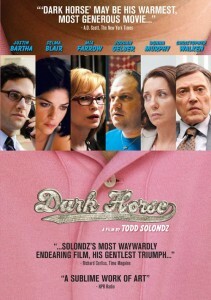 But others will be touched by Solondz’s deftly poetic touches amidst Dark Horse’s doses of cynicism.